It could have been your child or your pet maimed for life or killed in a hunter's killing trap mere yards from a public trail used for walking, cycling, and cross-country skiing—a distance covered in seconds by both children and animals (the two most curious creatures in our daily lives). Faster than I could run after her, my dog Grace broke her lead and stuck her head into a wooden box of dead birds (bait) placed there to entice curious animals into a Conibear type of killing trap. She died after enduring an hour of extreme agony and pain. In that hour, I really saw just how much an animal suffers in these traps. My dog died in a killing trap, in a public place, where no sign was posted to warn the public of the danger of the nearby trap. For the moment, I'll avoid recounting the run for help. For the moment, I won't dwell about the cruelty—the more she pulled, the deeper into her head went the prongs. If her senseless death is to mean anything, then I must work towards and see a change to the regulations that govern trapping, such that the number of unintended victims of trappings is reduced. This is her legacy. I am not suggesting that hunters and trappers be left with no means of making a living, nor am I suggesting that animal control be abolished. I only seek that animal control, trapping, and hunting be done humanely and selectively. A killing trap is not selective. 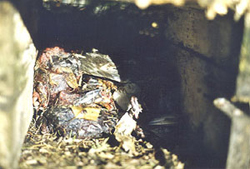 A live (or release) trap of the Havahart® type captures the animal without harming it, allowing the trapper to see what has been caught, and to intervene (for example, kill vermin, but release pets). There must be conscious and intelligent intervention prior to the non-selective destruction of whatever animal encounters a killing trap! Put up warning signs where traps are located, especially in public places. Remove traps from public areas. Abolish killing traps, and replace them with hold-and-release traps of the Havahart type. On November 12, 2002, I experienced a tragic moment that I soon realized did not need to happen. The purpose of this site is to improve communication, education, signage, and regulations related to trapping. If even one single person is spared from having to go through a similar tragedy, then it will have been worth it. One minute I was walking with Grace on the Aerobic Corridor. Nine-tenths of a kilometer from where I had parked, she went off the path, and soon afterwards I heard a short yelp. I began to hear a sound similar to the breathing sounds made by a porcupine she had once cornered. Fearing that she had been shot full of quills, I followed, and heard the breathing and a metal sound—Was she fighting with another dog!? When I found her, there was no porcupine, no other dog. The metal sound was a Conibear trap that she was trying to escape, but she lost the battle quickly. Her skull had been crushed by the trap, and within an hour, her black shape went from waving helplessly to lying motionless. She died in her car on the way to the veterinarian. Staring inanely, I listened to his chatter about leash laws and the price one pays for giving freedom to their dog, as he cut off the trap. Do you keep your children on a leash? Has your child ever suddenly wrenched their hand out of yours and taken off running towards something that captivates their interest and curiosity? Since I began making inquiries, I have learned that I am not the first person this has happened to, but that many people never say anything because they bought this reasoning that it was somehow their fault. It often happens in more remote areas, and to people who feel that they have no power to go against trapping traditions. This happened in a public place where people go with their children. Who would stay in the area with their children or pets if such a sign were posted? I would never have brought my dog there. Had my dog smelled the bait and taken off at a run before I was close enough to see where she had gone, I might not have found her to cut her from the trap. Now that I know where this particular trap is, I can see that, although it is concealed, it is within view of the Aerobic Corridor—anyone at any time could be treated to the sight of whatever was caught, in whatever state: dead, alive, half-alive, struggling, crying out. Local people as well as those from Montreal (45 minutes away) know the Aerobic Corridor very well; one person I told about the incident—a minister—mentioned that he goes berry-picking there with his family; to pick berries, you need to leave the path. Everyone I tell the story to is quite horrified by the incident. If this loss and the unforgettable anguish it will continue to bring until the end of my time is to mean anything, listen to this: I have an hour-and-a-half a day of walking time—plus brushing, feeding, playing, and hugging time—to devote to the following. I am requesting that, at the very least, signs be posted not only at the site of the traps, but in a wide perimeter, and especially at access points to the public area (for example, where people park their cars). Before you, your children, or your pets have even left your car, you would have been warned of the hazard. Much has happened in four weeks. It began with me seeing the death, through Grace, of the many hundreds of animals who die this way each year. Since then, I have learned of and spoken with some of the people who watched their pets die slowly and horribly. The only way I could divert my rage and sadness was to do this research, assemble the results, and present it all on this site. I have also learned much about trapping, and about the trap invented by Mr. Conibear as a "humane" alternative to leg-hold traps, because it supposedly kills instantly, which trappers are led to believe by marketing and sales literature. I'm convinced that his intention was sincere, but I can testify that this is not the case! 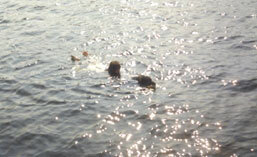 To hunt beaver, these traps are set underwater, where a beaver can breathe for 20 minutes, which it spends thrashing around, until it dies by drowning. If the supposedly humane Conibear trap killed instantly, then Grace would not have spent that hour as she did, with 4 prongs digging into her head by the ears and neck, her teeth and windpipe broken, gasping for air, and pulling to get away. If she had died in minutes, then the Conibear would have achieved its goal of instant kill, which it did not do. Approximately 75% of the harvest from these traps is discarded, which means that 3 out of 4 of their victims are unintended victims: pets, and animals that have been caught and killed, but whose fur is not valuable for profit. 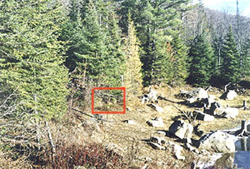 At least one hunter died of exposure after getting caught in his own trap, and there have been other mysterious, unresolved incidents involving unidentifiable human remains found near these traps. 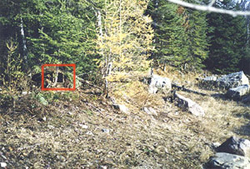 From an article in French, published in Journal La Vallée two weeks after Grace's death, I learned that the game warden had stated that as long as a trapper has a licence, they can trap anywhere, even in a public place! I phoned the game warden's office, and had a very empowering conversation with the Chief game warden, Claude Bourque. He has given me permission to quote him. From our conversation came not only valuable information, but also action, and beyond that, the possibility of further action, and the possibility of change. As a result of this conversation, I felt the first optimism I had known in weeks. I realized that if any positive change results from this chain of events, then Grace's sudden and grizzly death will not have been for nothing. 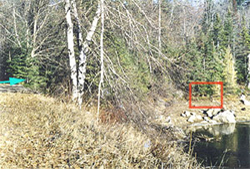 Quoting the article, I asked him: If a trapper with a permit can in fact place a trap in a populated area, is it unreasonable to ask that signs be put up—everywhere there is trapping—as a general part and parcel of trapping? As an example of another area where traps are set very close to people and pets, he mentioned that a lot of trapping goes on in Laval (a heavily populated island-city suburb of Montreal). He then gave me the phone number in Quebec City of a government department that can advise or assist me concerning the adding or changing of a law (the posting of warning signs). Then I raised my issue of the cruelty of the Conibear. I asked him if it was being idealistic to think that it might be possible for Conibears to be abolished, since leg-hold traps have already been abolished (even though they are still being used). He replied that it was an unlikely thing—that they want the animals dead in the trap. I just kept repeating how inhumane it was, and that companion animals need protection. Apparently (the literature has not yet arrived from the warden's office), in perfect laboratory conditions (the right animal in the right trap), death occurs within seconds. The unfortunate reality is that more often than not, the wrong animal gets into the wrong trap, in the wrong way (not straight-on) and suffers an agonizingly slow death. "However, they should not be used where they might take non-target animals." He said that the size of a trap relative to the size of the animal that determines how quickly it kills. A smaller animal dies more quickly. For example, a beaver would have died more quickly in this trap than Grace did, although when he mentioned that it might be a beaver trap (to hunt beaver, the traps are placed under water), I reminded him that it was well above water, and that the bait was fresh. 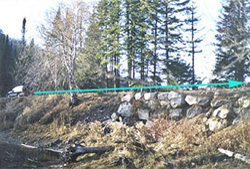 As a result, his office agreed to investigate the site. The police had already seized the trap from the vet (according to the police, because I removed the trap with my dog's head in it, I could have been charged with theft), and the warden or one of his staff will go to the police station to examine the trap to determine its size, its state of repair, and its owner. From its size, they can determine what was being hunted. From its state of repair, they can determine whether it has been well maintained, which can affect its ability to do its job. 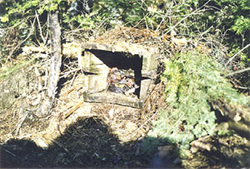 From the markings on the trap, they can identify its owner. The warden's office will also visit the trap site. To me, the bait box appears to have been there for years. I have requested that they remove the bait box as well, since I could not legally remove it. It took close to a year for that bait box to be removed. Ironically, the police destroyed the trap within 5 days, effectively destroying the evidence. By the end of the conversation, Mr. Bourque had stated that I could perhaps ask that the Conibear be abolished in public and populated areas. He has promised to get back to me, and I am hopeful that a positive change can be brought about. As this and other initiatives bear fruit, it will be reported here, in the Running Commentary page, where I will be keeping you all posted throughout this journey through the red tape. Havahart is a registered trademark of Woodstream Corporation. Home Pictures Commentary Media Coverage Leave a Comment Petitions What Can Be Done?